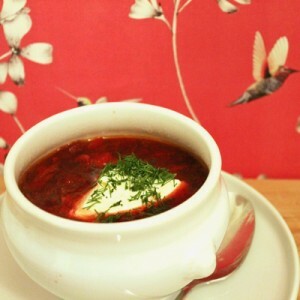 The Borscht is the most amazing soup on earth. Made with very simple ingredients it tastes like good old things. I simply love it. Its origins are Ukranian and it is spread throughout Russian countries, with number of variations. The secret for a good borscht is a good broth – this is what my ukranian friends said to me. 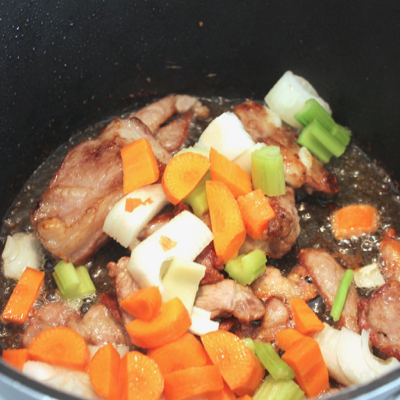 You can make a broth with pork or beef. I picked the first – since the humble origins of the plate made me feel cheaper pieces of pork were much easier to be found on a poor family table compared with beef. Up to you. 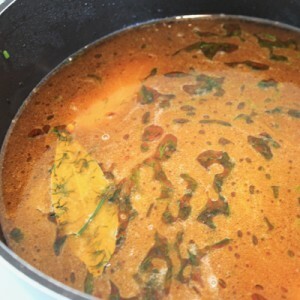 I made it relatively easier: the recipe below is to be made in 2 times. First you make the broth then the borscht. I asked my friend if I could use vinegar directly without making any infusion – she agreed. LOL. 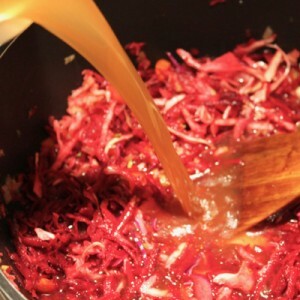 So let’s go with this Ukranian borscht! Heat the oil in a casserole. Fry the meat on high heat until brown. Add the onion, the carrot, the garlic and the celery all diced. Add 1 tsp of salt a 1 tsp of pepper. 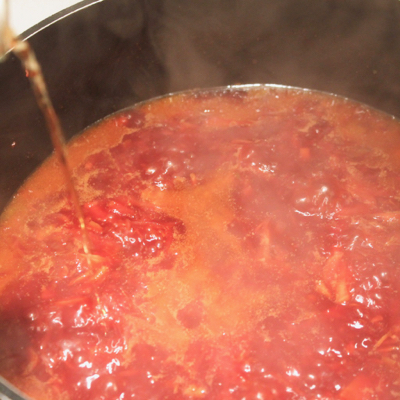 Add the tomato paste and fry for further 2 minutes. Add the dill roughly chopped, the bay leaves and 3 liters of water. Let simmer for 3 hours. 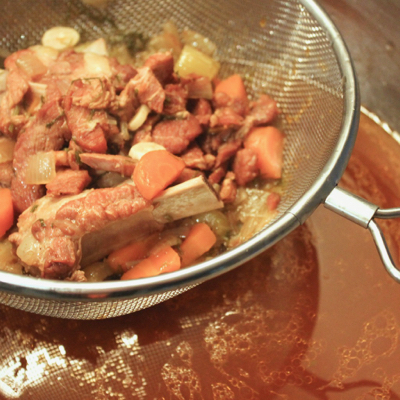 Drain with a colander and put the broth in a container-let it cool completely and put into the refrigerator until the fats become cold and hard. Retain the fat and keep in a air tight container (you will use it for the second part). 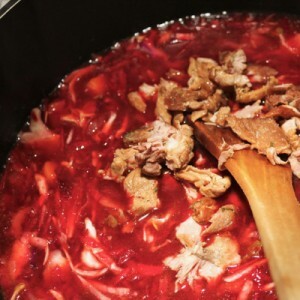 NOTE: if you want to use the broth straight ahead, then skim the fat off as much as you can and use 3 tbs of olive oil to fry the vegetables when you make the borsch. 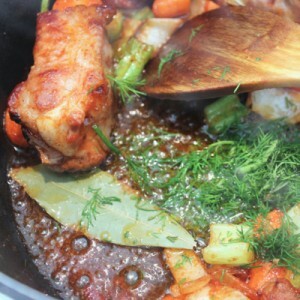 Separate and clean the meat and the vegetables and cut the meat into small pieces (discard the vegetables). 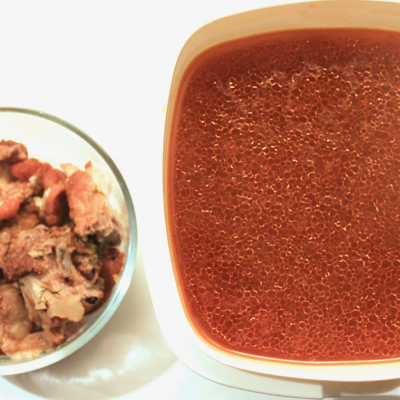 Keep the meat in a container (or freeze it along with the broth), until you make the borsch. 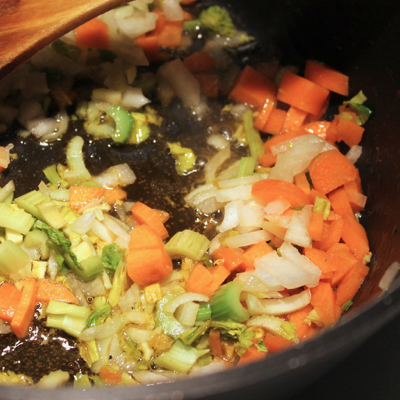 Now, melt in a casserole half of the fat retained from the broth (or the olive oil). Fry the onion, the garlic, the carrot and the celery (all finely sliced) for 7/8 minutes. 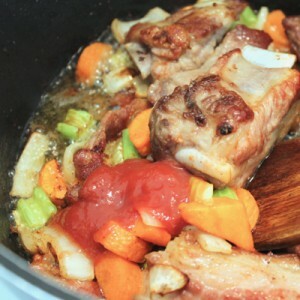 Add the tomato paste, fry for further 2 minutes. 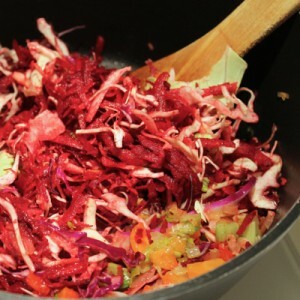 Add the meat (retained from the broth), and the remaining grated vegetables (beetroots, celery root, carrots and cabbage), fry for a couple of minutes and add the broth. 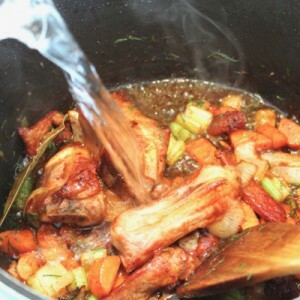 Simmer for 20 minutes (or until the vegetables are cooked through). NOTE: The vegetables must be cooked and still compact, a sort of ‘al dente’, be careful not to overcook them. Now add little by little the vinegar enough to balance the sweetness of the vegetables (you will need approximately 1/4 of a cup – but all is depending on your taste, add it little by little to make sure you reach the sourness you like – I like it sour). Serve in individual soup bowl, accompanied by a tbs of sour cream and a pinch of freshly chopped dill.